The answers you get depend on the questions you ask. But how do you know you’re asking the right questions? Critical thinking is a key skill required at university, whether at undergraduate level or postgraduate. This page shares a range of advice and guidance on how to build skills and confidence in critical thinking, reading and writing, helping you develop a reflective and critical approach to your research and writing. Bookmark this page, save it to your VLE, and add the page url to your reading list! In a free extract Mike Wallace and Alison Wray (authors of Critical Reading and Writing for Postgraduates) explain how to get started with critical reading. They look at how to focus with questions, evaluate what you read, understand what makes an argument convincing and using the Critical Synopsis technique. 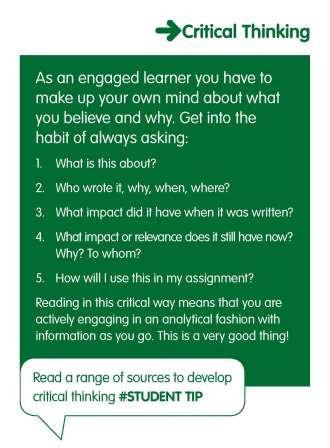 Listen to a podcast by Monica Gribben and download the accompanying activity to find out how to develop your critical skills and use them in your assignments. Questioning everything you read, whether it’s been written by a renowned academic or your favourite commentator on a topic. What was their purpose when writing their work? Do they explain their reasoning sufficiently? Are there alternative arguments and do they deal with them? Can you introduce anything from your wider research to contrast with or support this particular text? How do you define critical reading? What’s the difference between an opinion and an argument?